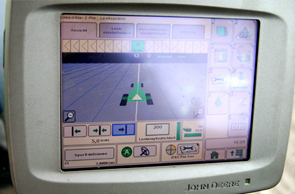 In ai-solution the future automation sector for agriculture will be concentrated and expanded. 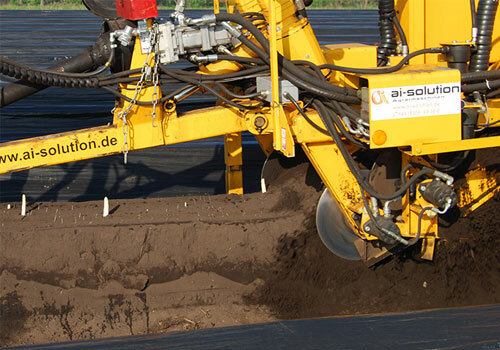 Being a subsidiary company of ASM Dimatec Germany, ai-solution can draw from long-lasting experiences in the automation of production processes in the industrial sector and in the production of automobiles. 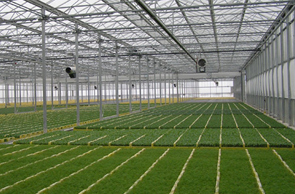 These experiences can be optimally transferred to the processes in agriculture. 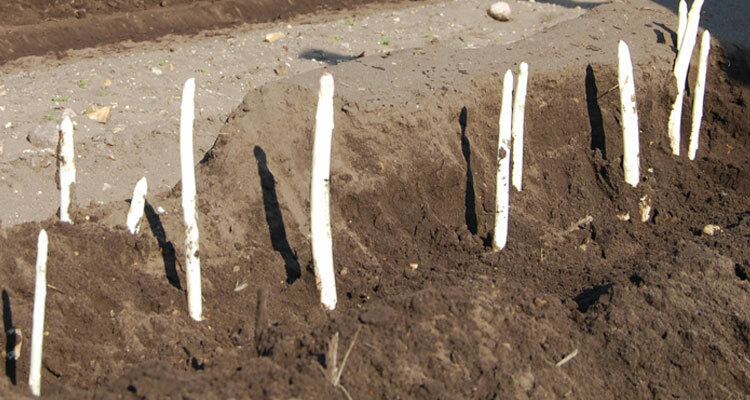 KIRPY picks up all the asparagus on the mound, takes the asparagus to a manual sorting mat and works the mound over. 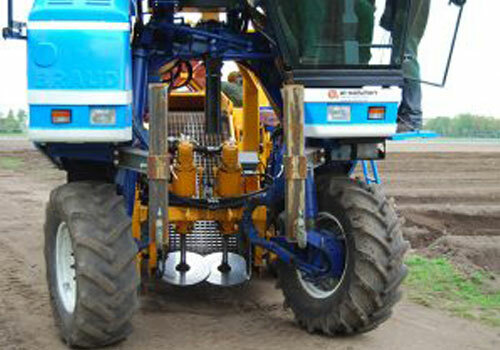 All the functions of the machine are hydraulic, with electric controls actuated from the tractor cab. 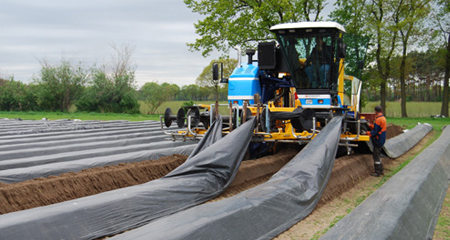 At the rate of 8 hours per day, KIRPY is capable of picking the vegetable over an operating area of 10 to 15 hectares. 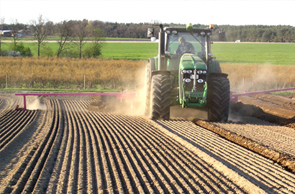 The profitability factor of this piece of equipment is assured with an extremely quick return on investment with reduced labor force. 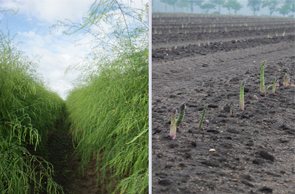 The Asparagus-Panther with its very interesting performance parameters and savings potentials marks the beginning of an enduring breakthrough in automatic reaping of the fine vegetables. 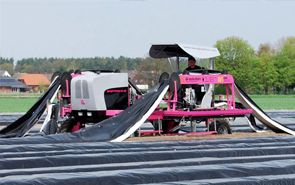 In times in which seasonal harvest workers account for a good quarter of the total costs in asparagus cultivation and furthermore are less frequently available, the pink-colored self propelling chair from Lower Saxonia is just convenient. 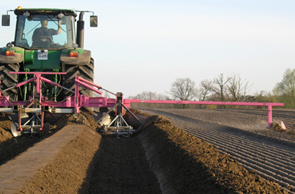 The innovative harvester allows quick and efficient reaping. 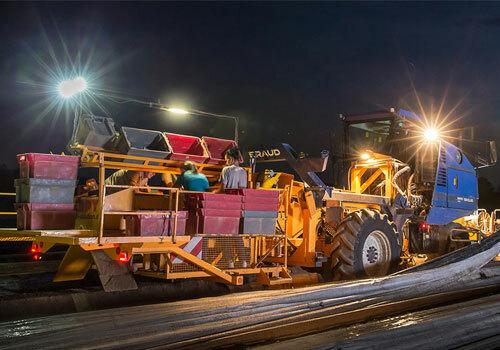 The productivity is additionally increased by the fact that the harvester can be operated up to 24 hours a day. 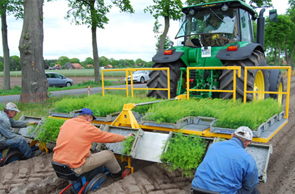 The innovative asparagus harvester allows quick and efficient reaping. 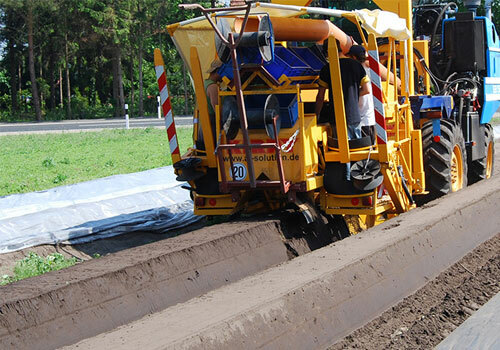 It minimizes manpower costs and personnel dependence and accelerates the reaping pace. 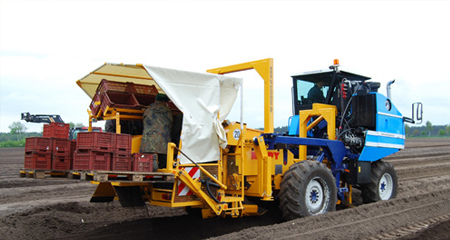 The productivity is additionally increased by the fact that the harvester can be operated up to 24 hours a day. 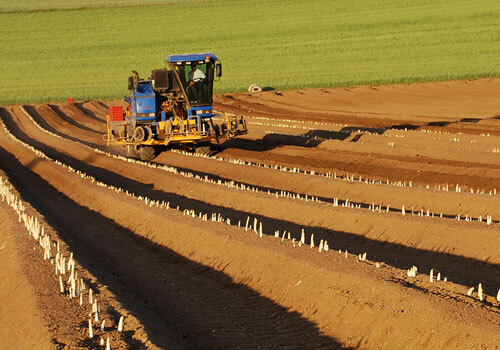 The quality of the fields is also enhanced: The soil is loosened and cleared from stones and old stalks by the machine, whereby the straight growth of the asparagus is supported. 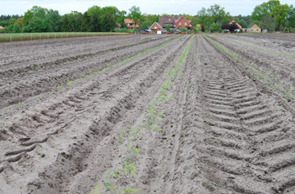 Rusting is reduced to a minimum. 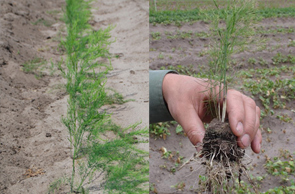 The innovative asparagus harvester cuts the bank 6 to 8 cm above the root. 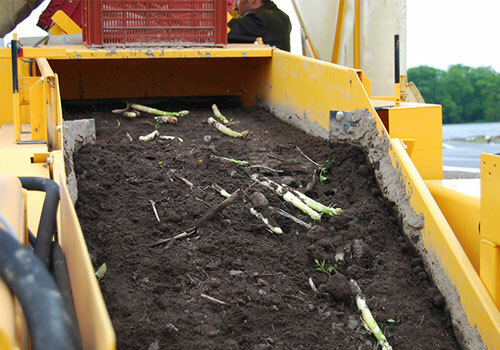 Soil and asparagus are gently transported across a screening band and separated. 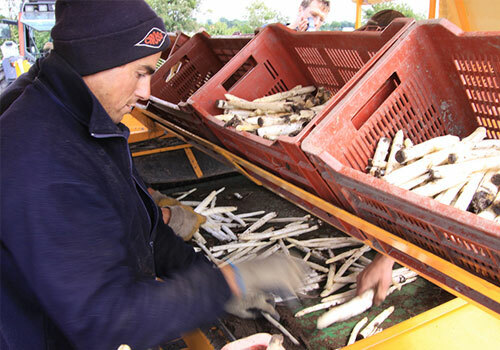 Then the asparagus is manually collected on a sorting band and stored in boxes on the gathering platform behind the machine. 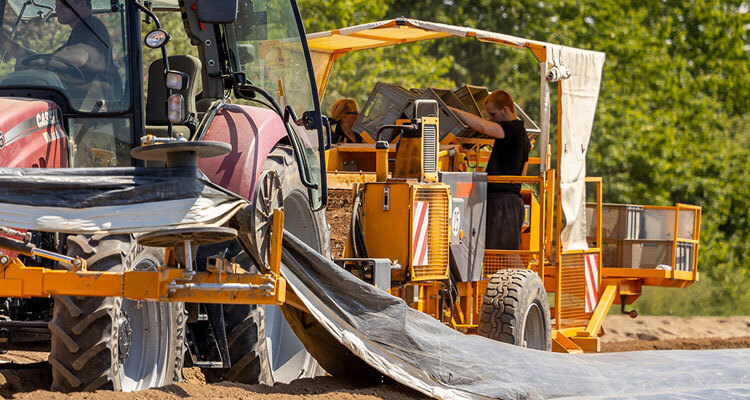 Inside the machine, the soil is cleared from stones and other types of impurities. 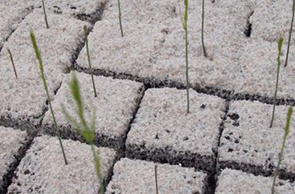 Finally a perfect bank is formed and build back up.